Is That Trader Joe’s Junk Food in Your Grocery Bag? There’s no denying that Trader Joe’s has a cult following. It has made food shopping fun. And not only has it made it fun, it makes people feel good about what they’re buying–proud of the fact that they got something seemingly healthier and better for them than the usual grocery store fare. There are vegetables! There are organic foods at affordable prices! There’s hummus! Let’s call it the “Trader Joe’s effect,” an effect that seduces the consumer and turns them from a conscious one into a blind one. Because when it comes down to it, just because it came in a Trader Joe’s bag, does not make it good for you. This is not to say that all food at Trader Joe’s is bad. 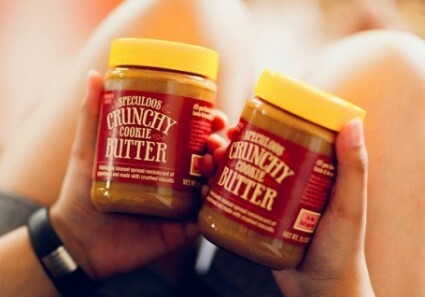 Certainly, the store has probably gotten more people eating nut butters than any other large chain, they do have a corporate policy against GMOs and you’ll often find that the ingredients list on the pack of packages is much shorter than what you find at your average grocery store. But it concerns me that Trader Joe’s often gets touted as a health food store. People see the TJ label and immediately think “organic and healthy!” Maybe it’s the organic virgin coconut oil, but the store’s reputation is so strong that consumers fail to peel back the layers. I like a junk food treat as much as the next person. Eating well is all about a little indulgence once in a while. But let’s not kid ourselves into thinking that shopping at a certain store means being able to shop blindly.Gourmet junk food is still junk food. Eating well is about buying real food, whole ingredients, and the occasional cookie. I can assure you that Joe-Joe’s don’t have a top spot because people just buy them occasionally. If your daily dinner is consisting of Mac ‘n Cheese followed by Triple Ginger Snaps doused in Speculoos Cookie Butter (which as the “crack” of the food world, has itsown Facebook page), you probably have some work to do. And while Trader Joe’s often has a very “green” image, the chain is in the market of selling marked down name brand products, which forces them to be very secretive about where the food comes from and how sustainable the business operations really are. So where does all the Trader Joe’s food – junk food and healthy food – come from? “It is very hard to figure out sourcing with Trader Joe’s. They heavily depend on private label products which are based on secrecy. We have said that private-label organics is an “oxymoron.” Organic consumers want to know “the story behind their food.” They want to know where it was produced, how it was produced, how the animals and workers involved have been treated, etc. None of that is possible with Trader Joe’s. Unlike the majority of all responsible brand marketers in organics they have refused to participate in our research studies and are thus rated very poorly on our scorecards that critique dairy foods, eggs and soy foods (etc. ),” Mark Kastel, Director of the Cornucopia Institute told Food Babe. So, even if those tasty chips are organic, doesn’t mean you can know the story behind them. A little junk food here and there may not kill you, and I have personally spent many an hour drooling in a Trader Joe’s aisle, but there’s an argument to be made about knowing where your food comes from and what your eating. And that requires conscious consumption, not just blindly pulling items off of a shelf at a store that has a smart and healthy image. What if All of Our Markets Were Local Food Markets? Will definitely fall into the “once in a while / junk food” category for me. You can easily contact the Trader Joe’s office and ask them about any of their products. They have higher regulations that the USDA and FDA. they have nutritionists on staff to research down to the seed that was used to produce that “junk food” Probably would have known that if you did a little more research. Traders is garbage food manufactured mostly by conagra, with the many recalls of food products you can rest assured you are not getting healthy food. Real healthy food costs money and there are no short cuts. Reputable healthy food companies do not manufacture for trader joe’s. It would undermine their brand. See pepperidge farm suing trader joes . Trader Joe’s are parasitic copiers. Big problem in the EU. Riding on the development and reputation of branded companies products.